One of the easiest ways for burglars to break into your home and make a clean, quick getaway is through the garage. Thieves have gotten good at breaking into garages within a few seconds by releasing the emergency pull handle from the outside and then manually lifting an unlocked garage door and entering. From there, they can stroll directly into the house if the door leading inside is unlocked! We’ve shared ways to avoid break ins in the past, encouraging you to either fasten your emergency release valve with a zip tie or to install a deadbolt lock to secure your door. 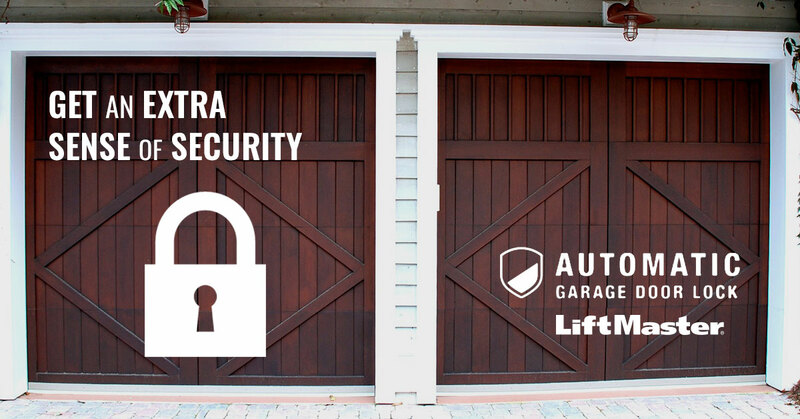 Now there’s an even better solution—the Automatic Garage Door Lock from LiftMaster. The new deadbolt lock is the first in the industry to work in tandem with LiftMaster openers to lock and unlock automatically whenever you open or close your garage door. LiftMaster affirms that this lock is “virtually impenetrable.” It’s also the first in the industry to be tested by UL. When the garage door closes, you’ll hear it lock, assuring you that you’re either leaving your home in safe hands before you drive away or securing your home at night so your family stays safe and sound as they sleep. If you live in an area where you experience strong winds or other extreme weather, consider installing a lock on each side of your door. Make sure to have your lock professionally installed so it’s done correctly to offer you maximum security. Check It Anywhere, Any Time! Not sure you closed the garage door before you left home? You can check using the MyQ smartphone app. Monitor your home and ensure it’s locked up and secure from wherever you are. You’ll receive notifications if the garage door is opened while you’re away, and you can close it using your smartphone. Will the new lock work with my garage door? If you have a LiftMaster Wi-Fi garage door opener, check to see if it has an image of a shield on the side. If it does, the new lock will work with your opener. If you live in the Des Moines area and you’re interested in installing either a new garage door opener or the Automatic Garage Door Lock we just described, contact WD Door. We want to help you make your garage and home safer and more secure for your whole family.